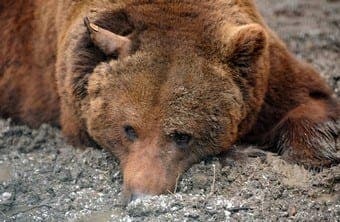 Listed in the Spanish Catalogue of Endangered Species (Catálogo Nacional de Especies Amenazadas) as being in danger of extinction, the Cantabrian brown bear’s existence in Spain is not widely known. CANTABRIAN brown bears have developed a slightly different genetic identity to other brown bears, including the European. This is due to the geography of the Iberian peninsula effectively cutting them off from other populations to the North. However, they have not been recognised by the scientific community as a distinct subspecies, being referred to as simply Ursus arctos. Having once roamed most of the mountains of the Iberian peninsula, the Cantabrian brown bear was seen by man to be competition for food and the population was reduced in the first half of the 20th century to two isolated pockets in the northerly mountains of the Cordillera Cantábrica mountain range. Systematic persecution through hunting led to a drastic decline in numbers and a total ban on hunting did not come into force until 1973. The maximum fine for killing a bear in Spain is now 300,000 euros. The latest figures give a total of about 160 bears split into two populations, 120 to130 straddling the borders of Asturias, León and Galicia to the west and a second population of 30 to 40 around the borders of Cantabria, León and Asturias to the east. The two colonies are separated by just 30 kilometres. Weighing in at an average of 130 kilogrammes for females and 180kg for males and measuring between 1.6 and 2 metres in length and between 0.90 and 1 metre in height, the Cantabrian brown bear, or oso pardo cantábrico, is the smallest of the bear family. Their weight varies hugely depending on the time of year. Emerging from their winter hibernative state they can be very underweight and need to feed to restore their body fat. During the autumn they should be at their heaviest in readiness for the winter, although the last couple of winters in the Cordillera Cantábrica have been so mild that the bears have not needed to hibernate at all. After mating in the spring females give birth in December or January to cubs weighing only about 350g each. This is tiny compared to the size of the mother and does not correlate with the length of the nine-month gestation period. Interestingly, it has been discovered that there is a natural delay in the development of the fertilised eggs early on at the blastocyst stage (before the foetus or placenta has developed). The eggs are not implanted into the uterus until five months after mating. This is attributed to the fact that the female does not eat during the latter stages of pregnancy as her metabolic rate slows down for winter. To compensate for this her milk is extremely rich in nutrients and the young do not need to suckle as much as other mammals. Litters are usually two, occasionally three, and will stay with their mother for 18 months to two years. Infant mortality is high with only one of the young likely to reach maturity. On emerging from the den in spring, the cubs have many dangers to face including disease and the male adult bear’s predilection for infanticide. This in the hope the mother is brought prematurely into season again, this not occurring naturally for about three years after giving birth. The main cause of death among bears is now, however, man-induced. Furtive trapping using snares as well as poisoned bait left for other species such as wild boar still causes deaths among bears. Between 1980 and 1994, 54 Cantabrian brown bears died at the hands of furtive hunters. Of these, 19 were caught in traps, two were poisoned and the rest were shot. Unlike the grizzly and black bear, the oso pardo cantábrico is not aggressive to humans and would rather flee than confront man. The Cantabrian brown bear is an opportunistic omnivore. Eating mainly plants, roots, fruit, berries and nuts, its mostly vegetarian diet is supplemented by insects, eggs, honey, fungi and carrion. Since the outbreak of Bovine spongiform encephalopathy (BSE or mad cow disease), the European Union brought in laws enforcing the removal of carcasses from the countryside. This had led to a drastic shortage of carrion for the more well-known carrion eaters such as Griffon vultures and Red kites. A less well-known fact is that bears also rely on carrion, especially in spring when they need to boost their body weight and in the autumn when they need to store as much fat as possible to survive the coming winter and its scarce food supply. It is estimated eight to ten cubs died this spring (2007) due to, it is believed, the lack of carrion on the ground. Apiarists (beekeepers) are also suffering as beehives are being destroyed by the bears in their search for other food supplies. Although the laws have been revised conditionally for the re-opening of feeding stations (muladeros) for carrion eating birds, provision has yet to be made for the bears. The matter is “currently under discussion” at the EU. Conservation efforts presently centre on joining the two isolated populations with the purpose of strengthening the gene pool to create a viable population of bears. Groups such as the Fundación Oso Pardo (FOP) and the Fundación para la Protección de Animales Salvajes (FAPAS) are working towards creating a communication corridor of protected land for the two bear-inhabited zones. Fapas, in particular, are doing some very interesting work including photographic monitoring, planting of fruit trees, encouraging the goodwill of hunters to collaborate with the locating of snares and the installation of beehives. A “Plan para la Recuperación del Oso Pardo Cantábrico” has been drawn up by the Spanish Ministry of the Environment to unite all efforts towards the conservation of this most emblematic of Spanish species. A major threat to the bear’s survival, however, is currently being posed in the form of a macro ski resort. It is projected to be built in the area of the San Glorio pass in the middle of the main corridor of access for the two bear populations. Much of this area is covered by the EU’s Natura 2000 and Habitat’s Directive protection laws. A national law, the Ley de Ordenación del Territorio has already been modified in favour of the project due to alleged pressure from lawyers working for the promoters of the resort (Tres Provincias S.A) to enable it to go ahead. A Green Party MEP based in Valencia, David Hammerstein, has taken the matter to the EU and groups such as the Plataforma en Defensa de San Glorio (PDSG) are working towards halting the project. Ridiculously, the promoters of the planned ski resort have asked the EU for 45,000,000 euros to finance the project – the very same institution that made the laws to protect the rich, natural habitat of the area. Lisa has also organised an online protest petition that needs your help and can be signed at www.thepetitionsite.com/petition/418999897 (Save Spanish Bears!). The procedure is simple and quick and every signature counts.